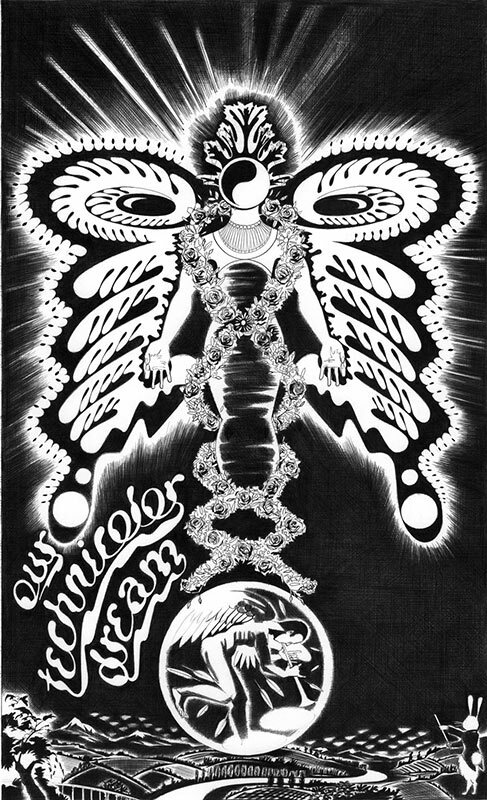 Ballpoint pen artwork for a silkscreen poster promoting a one day psychedelic event at the Institute of Contemporary Art, London. April 2007. 734mm x 425mm. I recieved the commission because of my involvement in the design of the original 14 Hour Technicolour Dream poster for event held at the Alexandra Palace in 1967. So, after 40 years, I found myself doing a psychedelic poster again. The spirit of 67 is represented by the pied piper figure in the bubble that floats over the landscape. The spirit of 07 rises as a new-born butterfly depicting the life of the new event for one magnificent day, its wings carry a knowing stare onto the festivities about to unfold. In another reading the butterfly figure refers to the dawn of the Aquarian age and the rise of feminine values expressing care for the earth in contrast to the fallen angel of masculine values that have exhausted the earth. The posters narratives, its use of pattern and colour, its borrowing from both Eastern and Western mythologies, signs and symbols contribute to its psychedelic personality.